Other than that, I've been working on cleaning up my paint room. It's been awhile, and I'm finally unpacking boxes of miniatures I've hoarded with a good portion of my paycheck. I call them "investments" :) I now have a circular shelf dedicated to Kingdom Death miniatures. As I paint them, they'll sit in their places in front of the boxes. I now have quite a bit of art and I'm thinking about buying cheap IKEA frames to display them. Remember back when I said I wouldn't choose to display some of the art in my home? Well, I've changed my mind– my hobby room is my personal haven and I think it would be fun to create a collage of my favorite examples of Kingdom Death concept art. As far as actual painting goes, I'm about done with little miss Twilight Knight. Clint & Yeji bought me this little gal as a surprise last Halloween and I'm happy to say she's almost done! It's been a miniature that's sat on my shelf in between commissions and I'm happy to have her almost finished– so close! It's the first time I'm experimenting with OSL, Object Source Lighting. I'm using orange and yellow glazes on the underside of her sword, legs, and base. 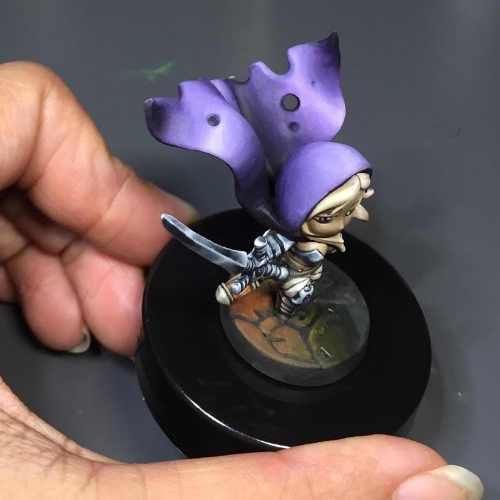 I want to create a controlled glow rather than a bright glow that illuminates the entire miniature. 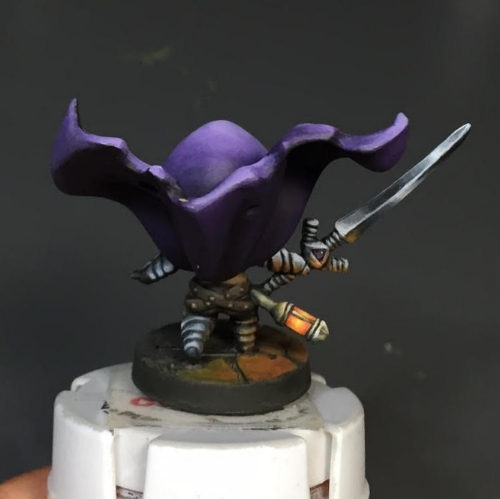 I think the orange and the purple offsets each other and gives quite a bit of colorful interest to the miniature. While I especially enjoy painting dark olive skin, I especially love the "gyaru" look this little chibi has with the platinum blonde hair and the warm skin tone. As far as gaming goes, I haven't played much Overwatch lately (which is good, it means I've been painting). However, I did indulge in the Steam Summer Sale and have been playing more Amnesia: Memories, the first otome game I've ever played. This time, I'm playing through the game's Diamond World, which is interesting, to say the least. Toma is intense, loving, and protective– which is endearing until it takes a disturbingly dark turn. I've gotten two bad endings and a normal ending in the subsequent playthroughs of the same world, and I can't seem to land on the "Good Ending" (not that there truly is one). Still, I'm a completionist when it comes to video games, and I'll need to achieve that before I can move on. And speaking of moving on, it's time to paint and I think I'll see if there's room in tonight's Hobby Hangout that started a few minutes ago. This is a rare occasion for me that I'm able to paint and join a Google Hang. See you around!